Siigrid Lii’bilnaghahi (20) has her shot blocked by a teammate of Gallup Lady Bengal Cearra Williams (10) on Friday in Kirtland, N.M. The Lady Broncos defeated Gallup, 54-33. 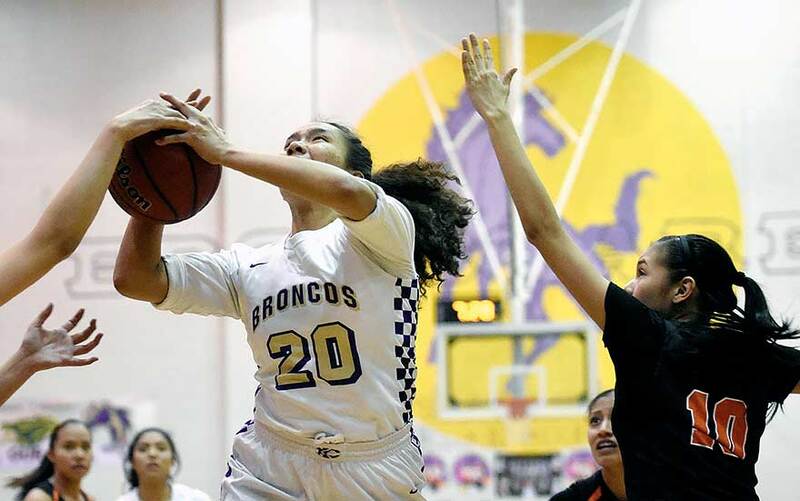 Despite playing one of their bigger district rivals, the Kirtland Central Lady Broncos were willing to take risks. Going up against District 1-4A rival Gallup last week, KC decided to run their opponents as they had all season. Kirtland Central coach Devon Manning said the team was not about to change anything about their mentality. Last Friday night was no different. The Lady Broncos battled with Gallup at the start of the game but pulled a 11-0 run midway through the first quarter to take the 19-7 lead, despite a timeout by Gallup. They held the Lady Bengals to lead after the first quarter, 19-9. In the second quarter, Kirtland Central continued to pressure the Lady Bengals, while Gallup tried to attack the basket with little success. Kirtland Central led 28-17 at the half. Gallup coach Todd McBroom said his team simply didn’t show up. Kirtland Central extended their lead in the third quarter, kicking the quarter off with a 9-0 run to lead 36-17. Gallup scraped at the Lady Broncos lead but found little success. Kirtland Central held Gallup to four points to lead 41-21 at the end of the third quarter.